Tourism remains the strong driver of restaurant traffic and opportunity. As the 2014 Restaurant Growth Index—compiled exclusively for Restaurant Business by Nielsen—shows, consumers continue to loosen their purse strings and indulge in restaurant dining while on vacation. In tourism-focused areas such as Nevada and Hawaii, the top two states for restaurant growth in 2014, vacationers present a huge opportunity, with the number of travelers visiting each month often significantly exceeding the resident population. As the economy strengthens and consumer confidence approaches prerecession levels, more consumers feel comfortable spending discretionary income on vacations. According to the Nielsen Global Consumer Confidence study, 31 percent of consumers reported spending their discretionary income on vacations in the second quarter of 2014, that’s up from 22 percent in the second quarter of 2013—and the trend is expected to grow. Another factor driving these growth areas is increasing consumer desire for gathering places within their communities, serving as a counterbalance to ever-increasing digital interactions. Nielsen reported on this in its “2014 State of Shopping Centers” study, and this desire for authentic, physical gathering spaces extends from malls to restaurants. This is particularly true in smaller markets where gathering spaces are few and far between, and residents look at restaurants as local landmarks that are more than just places to eat but also places to meet friends and celebrate occasions. Looking at the markets that scored highest, the influence of tourism and community on restaurant growth is evident. In addition to drawing tourists, the top five markets have residents who are more likely than the average U.S. consumer to frequently dine at both quick-service and sit-down restaurants. 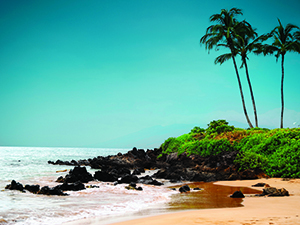 This locale, on the island of Maui, tops the charts in 2014 with restaurant sales of almost $5,000 per capita. The “aloha” spirit brings roughly 203,000 visitors per month to Maui, according to the Hawaii Tourism Bureau, translating to strong demand for restaurant options. Visitors here find more than just luaus and beaches; Lahaina also features the most art galleries per capita, drawing an eclectic mix of tourists. No longer just a destination for gambling, magic shows and bachelor parties, Sin City is thriving. Celebrity chefs continue to be a draw, helping fuel the appeal to tourists and restaurant sales of roughly $3,500 per capita. Despite a volatile local economy still recovering from a housing-bubble hit, tourism is strong and stable. On average, 3.5 million people visit Las Vegas every month, according to its tourism bureau, and they have their pick of almost 5,000 restaurants. The “Garden Isle” of Kauai, Hawaii, draws roughly 24,000 visitors each month, the Hawaii Tourism Bureau reports. Kapaa has a high concentration of shopping centers, water-sports centers and restaurants that cater to tourists. In addition to tourism, Kapaa features a strong local community; its residents value locally produced food and are more likely than the average U.S. consumer to serve as advocates for restaurants they like. Authentic Hawaiian character is vital in appealing to both residents and tourists. This market, with strong ties to Toledo, has seen increased economic growth with the headquarters of Marathon Petroleum and Cooper Tire & Rubber Company creating employment demand and increasing business travel to the area. Kohl’s and Whirlpool also have major distribution centers in Findlay, providing a stable pool of residents. This small town puts a premium on the community gathering space restaurants offer, particularly space to celebrate with friends and family. Famous for more than being Dolly Parton’s hometown, Sevierville attracts both visitors and residents with outlet malls, antique shops and Smoky Mountain National Park. In addition to national chain restaurants, many local restaurants offer authentic mountain cooking, giving diners a unique experience and driving just over $4,000 in restaurant sales per capita. —Lucas Manteca, co-owner of The Red Store general store, coffee shop and restaurant in Cape May Point, N.J. and Quahog’s Seafood Shack in Stone Harbor, N.J.
—Kristie Campbell, co-owner of Firefly Grill in Effingham, Ill.
—John Currence, chef-owner of City Grocery Restaurant Group in Oxford, Miss.